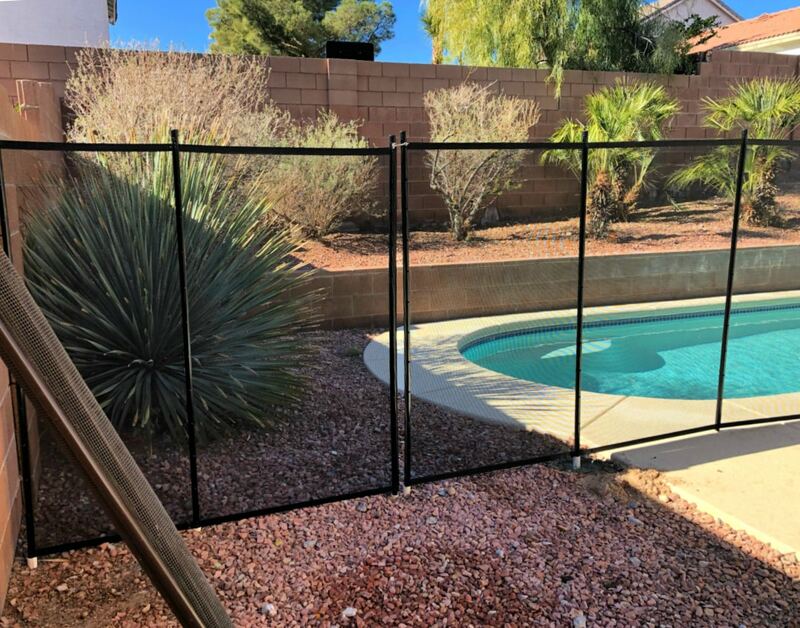 In regards to a pool fence install – here are some guidelines and general tips to consider when planning the fence route. In most cases, the fence should be positioned a minimum of 24 inches from the water’s edge. This makes it safer for you and your children or guests to walk around safely inside the fence while maintaining the pool, or retrieving a person or object from the pool. Ideally, the fence should not be located any closer than 20 inches from the waters edge; swimmers need space to pull themselves out of the water and to sit on the edge of the pool. Preferably, the pool fence path should be across a solid surface such as concrete, paver stones, flagstone set in mortar over concrete, or coated concrete decks, preferably level. Remember, the fence is tension-based and must be set into a rigid structure. This surface should be at least four inches thick and six inches wide to facilitate proper tension and installation. While we would all like to have our fence install go in a straight line, most of the time it’s not the best option. We need to provide bends or gradual turns to conform to the curvature of your pool or deck. Therefore when planning your pool fence installation try to avoid tight turns, U-turns, S-turns and 90- degree turns whenever possible, as they can create odd and opposing angles in tension-based fences. Katchakid, Inc. uses 45-degree turns for an aesthetically pleasing, safer and stronger tensioned-based fence. When applicable some pools may be partially fenced with a removable pool fence that also uses existing structures such as the property’s perimeter fencing, a wall, a part of the house or another outside structure to complete the barrier surrounding the pool. These structures may be wood, wrought iron, aluminum, stone or masonry and must be at least five feet high and in good condition. Is the surface level? If so, the fence will be safer and will be more aesthetically pleasing to the eye. Are there any steps in the pool deck that the pool fence will cross? Are there any sprinkler lines, gas lines, electrical lines possibly buried in the path of the fence? Will the fence traverse over any large dips in the surface (concrete or dirt) that would allow a child to crawl underneath and access the pool? Some concrete decks have in-deck drains that have drastic slopes in the concrete to the drain. Are there any windows, doors, or pet doors that can easily be opened by the child to allow access to the pool area? If so, the fence should follow a path that blocks access. Is there a structure too close to the fence path that a child can use to climb the fence? Common structures include: pool furniture, large toys, potted plants, trees, boxes, etc. Use your imagination, because kids certainly will! Is there an outdoor cooking, or bar area that is too close to the fence path? Can children use this structure to climb over and have access to the pool? Most cook areas are too short, or difficult to attach a pool fence to due to countertop design, or poor construction materials. Have you chosen the safest possible route? For maximum security, the fence should not be routed less than 36 inches from permanent backyard features such as natural rocks and barbecue areas.